An archived paper of the Taliban regime during an interview with The Associated Press at the Afghanistan Center in Kabul University. Dupree heads one of the foremost research centers on Afghanistan's cultural heritage, which stretches back thousands of years - well before the Silk Road - when Alexander the Great and the religious prophet Zoroastra passed through. 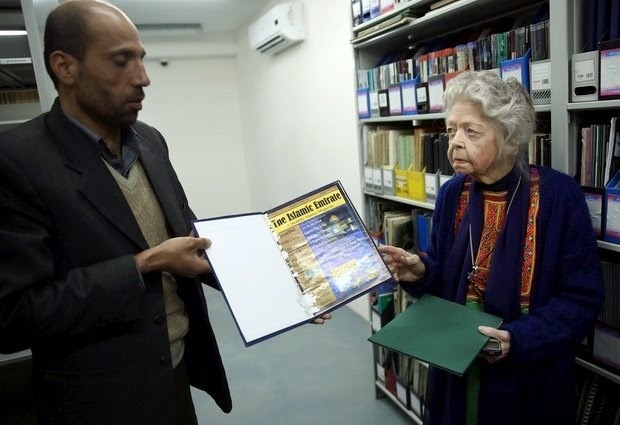 KABUL, AFGHANISTAN (AP) — Nancy Hatch Dupree fell in love with Afghanistan on her first visit in 1962, and embarked on a lifelong mission to preserve the rich cultural heritage of an ancient land scarred by modern wars. In happier times she traversed the country with the other love of her life — archaeologist Louis Dupree, a fellow American — studying its history, writing travelogues and collecting books, maps, photographs and even rare recordings of folk music. The couple continued their efforts, often from abroad, during the tumultuous decades that followed, and their vast collection, now housed at Kabul University's sunlit Afghanistan Center, provides a rare journey through the country's past. Small and bird-like with grey curls wound into a bun, the 87-year-old Dupree cuts a colorful figure in a bright green salwar kameez, blue cardigan and scarf as she walks through the halls, stopping now and then to point out her favorites among 90 photographs by Steve McCurry, best known for his 1985 National Geographic cover picture of a green-eyed Afghan refugee girl. The collection includes copies of a glossy monthly magazine, called "The Islamic Emirate," published in English by the Taliban during its 1996-2001 rule, as well as thousands of slides taken by Louis during his work on archaeological digs. There are newspapers dating back to the 1920s and books so rare that Dupree has the only known copies. Afghans regard Dupree as one of their own, with some even calling her "grandmother of the nation." President Ashraf Ghani found room at the university when he was chancellor in 2005 to store the tens of thousands of documents in the Dupree collection, and former President Hamid Karzai found the funds to build the center. Both men are old friends of hers. Dupree now heads one of the foremost research centers on Afghanistan's cultural heritage, which stretches back thousands of years — well before the Silk Road — when Alexander the Great and the religious prophet Zoroastra passed through. She laments that Afghanistan is barely understood beyond the seventh-century arrival of Islam, and that little of its historical tapestry or influence on the surrounding region appears in the local school curriculum. "History is my big love, and I find Afghans are not interested in history," Dupree said. "Many Afghans — especially among the young people who spent many years in refugee camps in Iran or Pakistan — don't have a sense of identity, they don't know what it means to be Afghan so they are always thinking about getting out of the country." Afghans can perhaps be forgiven for neglecting their history. The decade-long Soviet intervention in the 1980s was followed by a brutal civil war that ended with the rise of the Taliban, Islamic extremists who sought to obliterate the country's pre-Islamic past. They dynamited the towering Buddhas of Bamiyan shortly before the Sept. 11 attacks and the U.S.-led invasion. But Dupree sees cultural heritage not as a luxury of peaceful countries, but an essential element to knitting troubled ones back together. "They don't realize that the integrity of the country depends on cultural value. It's a question of realizing the strength of the country culturally, and that comes from valuing the past while welcoming the new — the two have to be meshed together and that is what we are trying to do here," she said. Dupree visited the 2,000-year-old Buddhas of Bamiyan in the country's central highlands shortly after arriving in Kabul as the wife of an American diplomat. From that trip, she wrote a guide book to Bamiyan which was to become the first in a series of travelogues that included her own black and white photography and captured an age long past. She took the Bamiyan manuscript to her future husband Louis Dupree in the hope of some guidance, but he was dismissive, she said, writing "adequate by nothing original" on the cover. She was incensed, "but I never left," she said. They were married in 1966. Their Kabul home became a salon of sorts, until Louis was accused of being an American spy and expelled from the country in 1978. The Soviets invaded the following year and the Duprees returned to the United States, where he taught at Duke University. Later they moved to Lahore, Pakistan, where they made contact with Afghan refugees and the charities helping them, and continued to amass a trove of information about the country. Dupree eventually returned to Afghanistan in 1992, three years after her husband's death, and since then has divided her time between Kabul and North Carolina, where she and Louis made a home. She has witnessed much of the sadness that has befallen Afghanistan in the modern era, and hopes the new president can sweep away the legacy of corruption and patronage that marked Karzai's 13 years in power. The Afghanistan Center's motto, "Nation Building through Information Sharing" sums up Dupree's personal mission to spread literacy to the vast majority of the population who can neither read nor write. The center has produced around 300 easy-to-read books on subjects ranging from bee-keeping to seismology, which are packed into mobile libraries and sent to remote communities. It is, she said, an effort to bridge the development divide. "We are trying to do a lot of things, but there are only 24 hours in a day," she said. Follow Lynne O'Donnell on Twitter at www.twitter.com/lynnekodonnell .